Open and inviting, richly appointed and steeped in tradition, Round Hill Hotel and Villas takes you far beyond the ordinary vacation getaway, from the 36 oceanfront guest rooms to one of the 26 luxury villas, you can book as your private home with dedicated staff, or a spacious villa suite. 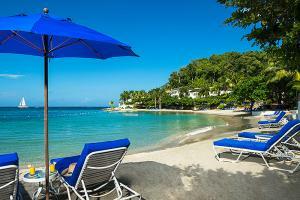 This elegant resort offers discreet impeccable service, attention to detail, and warm Jamaican hospitality. Experience our world class-spa, with Elemis treatments and enjoy sumptuous meal prepared by our award winning chef. Just 12km or 25 minutes drive west of the Sangsters International Airport in Montego Bay, Jamaica, on a beautiful peninsula. The Seaside Terrace serves as an exquisite setting for casual yet elegant dining for breakfast, Lunch or Dinner. Located alongside the lapping waves of the Caribbean Sea, guests can begin their day with a sumptuous breakfast buffet or enjoy any number of la carte items. On certain occasions a beach and deli grill will also be added to the a la carte offering. Black River, Negril, Dunns River Falls.